ORDERING Coats for Great Danes HAS CHANGED with new website updates, I'll explain.. This was once our custom Great Dane coat order page. During our "mobile friendly" website re launch we decided to leave this page published as not to mess with 10-years of client bookmarks. You can now order a coat, just as before, at our new website, jZ Canine.com following the links below. Everything else below the "How To Order" links has been left published as "additional information" and reference only. Read if you'd like but you'll need to order your coat at jZ Canine. You Have a Few Options Now.. If you'd rather read more about coat design first, visit the Custom Dog Coats info page or our Large Breed Dog gear main page. Go straight to jZ Canine Order Page to purchase coats for Great Danes. Start at jZ Canine Storefront to view all of our all-about-Great-Danes & jZ Canine products. Begin by visiting jZ Canine Homepage for product descriptions, product reviews and additional info. (TOP NAV MENU on our jZ Canine website). Stay here on all-about-Great-Danes.com and visit a page that explains the reason for our new jZ Canine website. Use your browser's "back" button, the "breadcrumbs" below in the blue header or click here to return to our Large Breed Dog gear main page. Ready for ALPINE HEAT? Let's built your Great Dane coat! Warmly, your confidence and satisfaction are top priority. 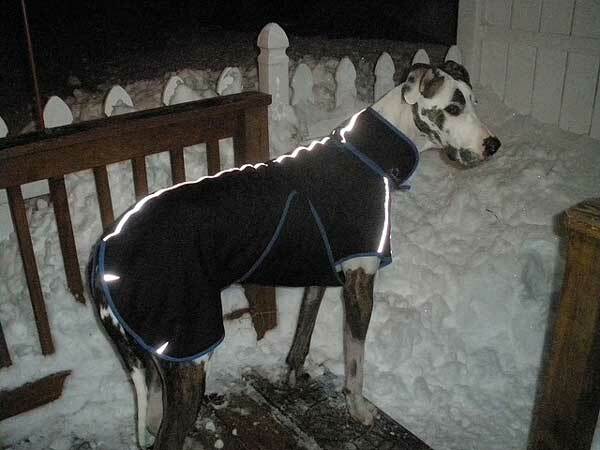 Alpenhitze™ coats for Great Danes "terms of sale" are available here if interested. Only here for a price comparison?, no problem :) To view prices, enter a Top Line measurement, "A" below, then scroll down the page to "Total", (lower left of page). You can play around with sizes of our coats for Great Danes, colors & shipping options, even view your cart. You are not placing an order and will not be charged unless you proceed through check-out. This page is separated into three vertical columns. The left column shows all new colors of Polartec, the main color of our coats for Great Danes and trim used to finish raw edges. Grab a pencil and paper here and jot down your favorite color combinations. Right column includes IMPORTANT information about our custom coats for Great Danes order process, measuring and custom options. Please take a moment and scan the right column prior to ordering. Center column is where you will complete your order using drop down fields. There are also two diagrams that illustrate measurement points, please do not add for "good measure". Don't forget to read the right column for important measuring information. OK LET'S START WITH COLOR & OPTIONS! All fields marked *Required* must be completed to place your order. This page is for Alpenhitze™ coats for Great Danes ordering only, please confirm this in the drop down field below. For all other breeds, please visit Alpenhitze™ "winter coats for dogs" page. 1. Begin by confirming this is a Great Dane coat. 3. Select your the main color for your Winter dog jacket here. Coats come with BLACK trim. Alternate colors are optional and additional cost. For a custom color not shown in the drop down menu choose ** Other **. 1. SPECIFY ** Other ** COLOR IN "INSTRUCTIONS TO MERCHANT" DURING CHECKOUT. If you would like custom embroidery, choose one or two sides here. ADD YOUR DOG'S NAME IN "INSTRUCTIONS TO MERCHANT" DURING CHECKOUT. Grab that paper and pencil now and jot down required measurements following the diagrams below. Use a seamstress tape or string and measure up your dog dimensions A through F following the diagrams below. Please provide dimensions, "A" through "F" below. Note Top Line is MOST important and also sets price of the coat (Don't add for "good measure"). Where are we shipping your Alpenhitze™ Winter dog coat? Please verify quantity and total below. Next "add to cart", or, "view cart" and proceed with check-out. Tip: While viewing your cart all the information you just entered should appear. If quantity is wrong, simply update the number and click "update cart". Custom trim colors are available in the drop down menu. Cost for custom trim is $45.00 and will be added to your order total if you choose this option. If you want a custom trim color other than what is available in the drop-down menu, select ** Other ** and SPECIFY COLOR IN THE "INSTRUCTIONS TO MERCHANT" AREA provided during checkout. Our coats for Great Danes can be custom embroidered in color of your choice on one side for $20.00, or both sides for $35.00. A drop down menu is provided for embroidery and cost will be added to your order total. If you choose custom embroidery, INCLUDE YOUR DOG'S NAME IN THE "INSTRUCTIONS TO MERCHANT" AREA provided during checkout (10 characters max). Proper top line measurement is a must as we have received some huge top line measurements, some as large as 38-inches! Proper top line measurement of our Alpenhitze™ coats for Great Danes is from very base of the neck, (where neck meets the back, just in front of the shoulders), to very base of tail, (top of the tail where it meets the body). Please do not add to top line measurements, this measurement is the most important! Questions? Send an Email or call (508) 538-1150 any time. All fields required prior to check out. All payments are processed on a secure Paypal server. Don't have a Paypal account? No problem, PayPal can process any of the following credit cards.